An inmate's escape leads to a judge's murder, but Sherlock can't figure out how she escaped. Watch Elementary Season 3 Episode 22 to find out how she did it. Joan finds the Stanley Cup in her bathtub. Sherlock bought it online and is trying to determine whether it is a fake or the genuine article. Two boys find a man stabbed with a screwdriver. Detective Bell is on a date. She gets a phone call and has to leave. He immediately gets a call afterwards. Joan and Sherlock arrive at the murder scene. The victim is Judge Dennis Vaughn. The other detective at the scene is the woman Bell is dating. From the fingerprints on the screwdriver, Sherlock surmises the murderer is a woman. Nikki Moreno escaped from prison and appears to be seeking revenge. Bell and Joan search her cell and she asks him about Detective Scott. He admits that they have been dating. She asks Sherlock if he knows Detective Scott's secret. He thinks she means about Scott being IA, which shocks Joan. She wonders if Bell knows. Joan tells Marcus about Detective Scott. Sherlock figures out how she escaped after Joan shares that Nikki had complained about working in the recycling center. Sherlock, Joan and Bell examine the hazardous bins outside the recycling center and find Nikki's body in one the bins. She was strangled prior to Judge Vaughn's murder. Who killed Judge Vaughn and why frame Nikki? Will Marcus confront his new girlfriend? Watch Elementary Season 3 Episode 22 to find out the answers. 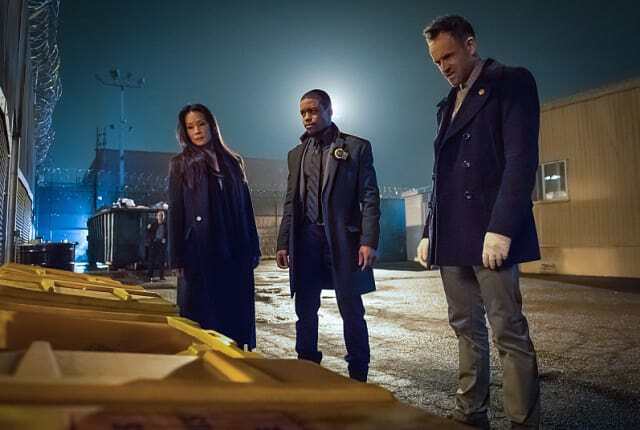 On Elementary Season 3 Episode 22, Joan and Sherlock head out on an interstate manhunt for an escaped convict who may have murdered a judge.